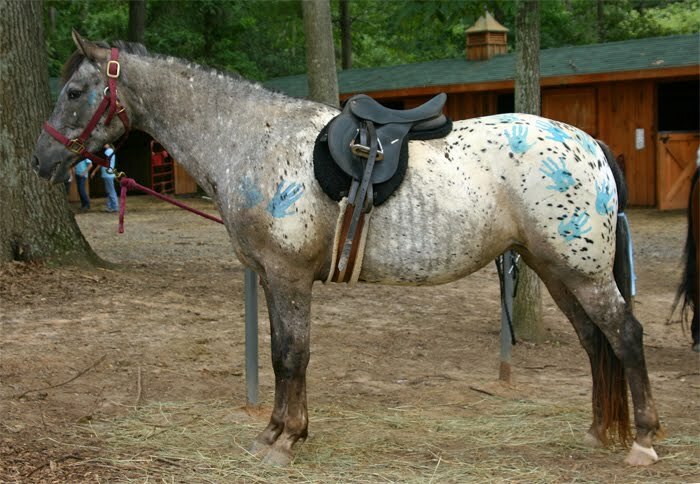 Appaloosa patterns have been on my mind lately. 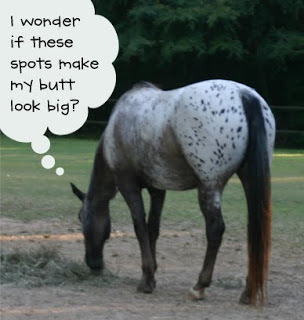 Some of that comes from watching the changes in my own mare’s pattern. After years of without much change, she has begun to roan more visibly. She still has her rib stripes, though the background color is far closer to gray than chocolate these days. It never ceases to amaze me how very vertical the lines are. They do not follow the contour of the body (like the stripes on a zebra) or the direction of hair growth. Instead they look like someone drew them with a ruler. I have been pondering the lines because I considered placing Sprinkle’s pattern on an Oliver, but I need to do a little research on how the stripes appear in foals (if in fact they do at all). That’s one of the pitfalls with appaloosa patterns; they are progressive so age matters. Sprinkles did get more white hairs each year, but the process was so slow I thought she’d be quite old before she looked really different. Then last fall I noticed she was getting a few white dots on the back of her ears. I have tried a few times to photograph them, but getting her head to point away from me when I am holding something as interesting as a camera is hard to do! This summer she started getting the same white dots on her legs. They are more numerous on her hind legs than her front, and far more to the inside than the outside. At the same time she is getting darker dots there, too, though they are much harder to catch since they are only visible in the right light. (The faded parts of her coat are somewhat iridescent.) The spots are quite muted and soft in outline, much like the Tetrarch spots some grey horses get. You can also see that she has a completely shell hoof on that leg. 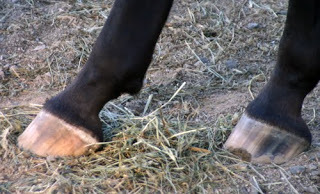 Appaloosas have stripes on their hooves when they have solid legs, but when there are white markings they have shell hooves just like any other horse. That is, unless they are homozygous for the “master switch” for the appaloosa patterns. 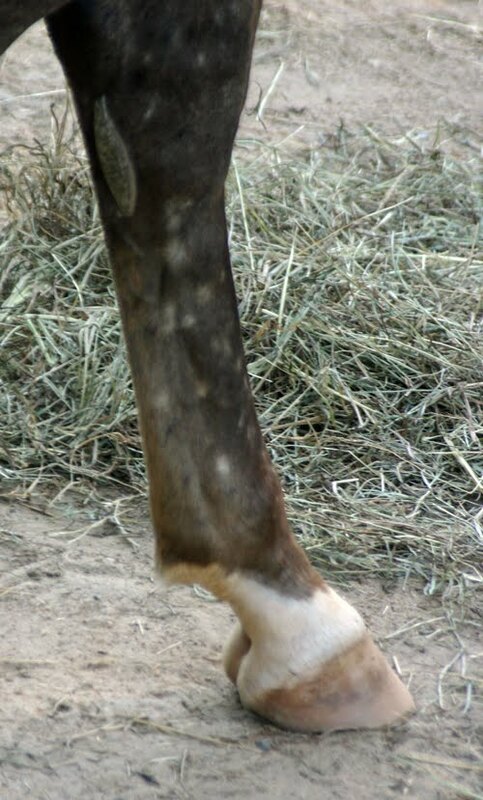 Those horses have shell hooves (or nearly so) no matter what color the leg is. Which is why I find one of Sprinkle’s buddies so interesting. I have shared pictures of Jag before. 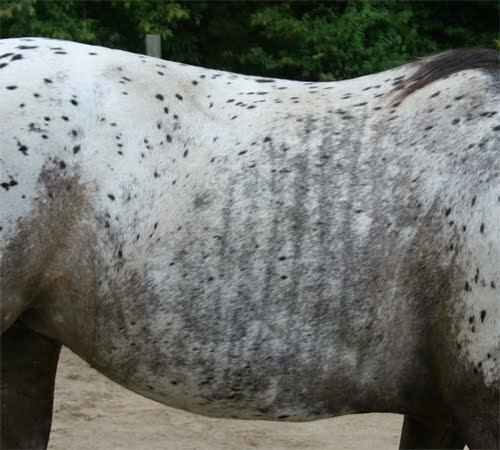 He is a black blanket appaloosa with the splash gene. 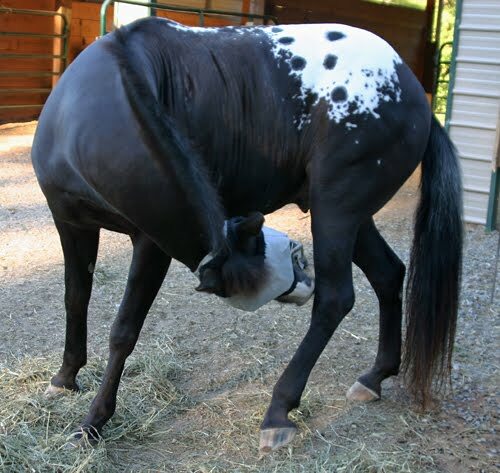 He is certainly not homozygous because his blanket is spotted; homozygous blanket appaloosas end up as snowcaps. These are the two sides of his blanket pattern. He certainly has spots. 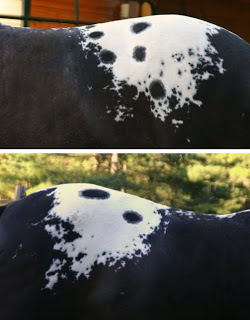 He also has the neatest white patches that run all along his spine up to his withers. One of these days I’ll remember to get a shot of that, too. So he is heterozygous and black. Yet his hooves are almost shell colored, they are so minimally striped. I have wondered if this is just a normal variation of expression, or if it is related to his carrying the splash gene, or some other combination of factors. That is what makes appaloosas (and sabinos, for that matter) so very interesting to me. The appearance of the pattern depends on the interaction of many different genes rather than a single one, so it is a puzzle to determine which traits can occur in conjunction and which ones cannot. Like I said, part of my interest comes from being around Sprinkles. But I am also looking forward to glazing, which I will begin again in earnest as soon as Elsie’s molds are drying. 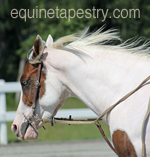 Almost all the horses that come up next in line are appaloosas, or appaloosas in combination with some other pattern. I want to get all these little things right when the time comes, so I’ve been asking myself these kinds of questions. Oh, and one last photo. This one is for my friend Sarah. Jag is the only pony at my barn that is plumper than my own, so when he turned to scratch his leg I just had to catch all those wrinkles for her! 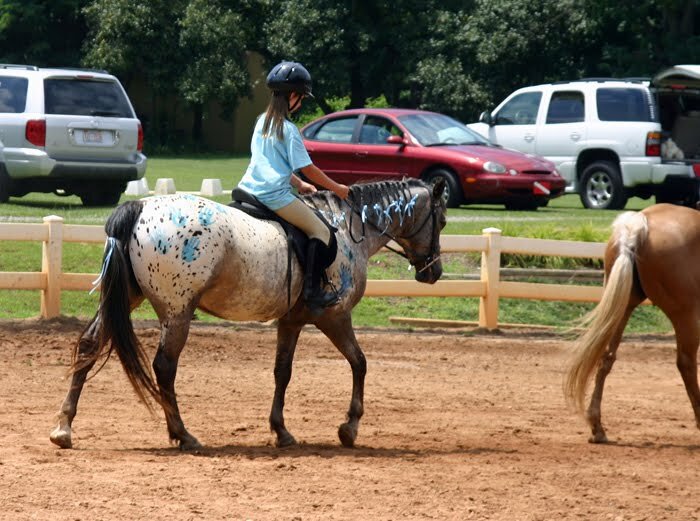 All the kids have been away at camp these last few weeks, including my pony, Sprinkles. The barn where I board her hosts a summer camp, and we thought it would be a good experience for her. She is a favorite among the campers, and certainly loves all the attention. In the picture above, she’s been “decorated” with Carolina blue handprints for the show the kids put on for the last day of camp. Of course she also needed lots of blue ribbons to complete the picture! She is also – finally – roaning out. Sprinkles is a suppressed leopard, which means that over time her forehand will roan out to reveal more spotting until she more closely resembles a true leopard. In the right light, the spotting on her face is now visible but I decided to wait until she wasn’t done up in blue paint to try to get those pictures. In addition to clearing the shelves, I also made a fun discovery about a small project I had abandoned sometime last year. It had not worked as I envisioned it, so I set it aside. It turns out to be perfect for another application. Once the final results are out of the kiln (with luck, that will be tomorrow) I will post it.